Ribot is our linear sofa with leather cover and it can furnish the most exclusive environments thanks to the natural sophisticated elegance. Choose your cover and color and add the item to your cart. Do you need some help? Do not hesitate to talk to us. We are please to assist you in answering all your questions. The leather sofa Ribot has a perfect balance: elegance, fine tailoring tradition and modern design set together. It has been designed and manufactured like an haute couture dress: it has pinched seams to underline the structure and soft volumes to offer the best comfort. The structure is in solid wood reinforced with a metal frame, padded with polyurethane foam and goose down. 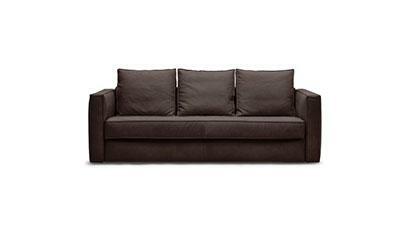 It has a leather cover that offers the best comfort and elegance even to the most demanding customers.